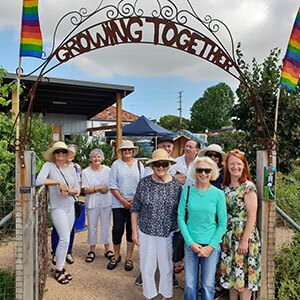 The gardeners from the Poowong Garden Club loved seeing what is happening around the garden’s in the Warragul and surrounding area. We all had a lot of laughs, a fun day out and experienced some truly magnificent gardens. One of the gardens we visited was Bingara which is nested up in the hills of Trafalgar South. This garden is a true delight with its orchard, carefully manicured vegetable garden, vast lawns and landscaping to highlight the native bush backdrop which reflects in a large dam. Then beyond the garden we discover a boardwalk taking us through a tranquil wetland where we can hear the frogs and birds playing around the pond. A true delight to the senses. We then moved on to Three Springs, an inspirational garden highlighting sustainable living. Filled with vegetables and fruit and the clucking of chooks, another special garden. Around the Mulberry in Trafalgar lived up to its name with a magnificent Mulberry tree draping its tantalising fruit down to the cool shaded garden below. This garden was full of wonder with a blend of art and nature together. Our generous hosts shared some home-made sourdough bread with dips, cheeses and fruit which topped off our garden adventures. With an artist in every garden there was extra delight at each venue and we all had a great day out with friends. If you have a social group looking for a great day out together, contact us today on 0430 150 990.